Williams is only offering a 6 pct premium for the quarter of its subsidiary it doesn’t own. Enbridge and Cheniere put even less on the table. The recent loss of some tax breaks makes MLPs less attractive and prompted the moves. But independent shareholders are getting a raw deal. 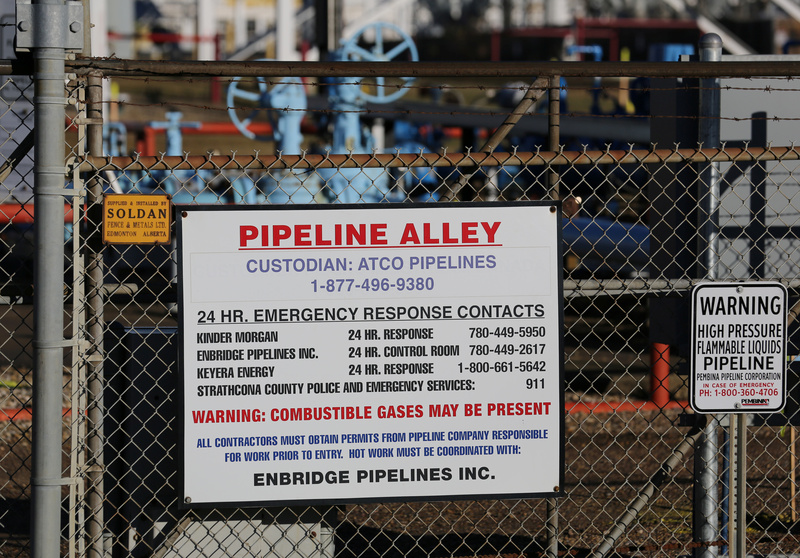 A sign listing emergency contacts for the companies on "Pipeline Alley" (Kinder Morgan, Enbridge and Keyera Energy) are seen at an industrial zone dubbed "Refinery Row" in Sherwood Park, near Edmonton, Alberta, Canada November 13, 2016. Williams Companies, Enbridge and Cheniere Energy each announced on May 17 that they would buy the minority stakes in their affiliated master limited partnerships that they don’t already own. The deals, all announced on May 17, are a response to the Federal Energy Regulatory Commission in March removing a tax break that allowed MLPs to increase rates to pipeline holders to accommodate for taxes that its owners paid on income. Williams Companies has offered a stock-for-unit exchange ratio of 1.494 Williams shares for each Williams Partners WPZ.N unit. The deal, valued at some $10.5 billion, equates to a roughly 6.4 percent premium to the previous day’s closing price. Enbridge said it would buy the shares of four separate listed entities to simplify its structure. Of these, three are being done as an exchange for stock with ratios equivalent to the trading price of each entity's shares or units the prior day, while the fourth carries a 5 percent premium. Cheniere Energy is offering 0.45 Cheniere shares for each outstanding publicly held share of Cheniere Partners Holdings CQH.A, or $28.24 per common share, a roughly 1 percent premium to the previous day's close.